Macedonian apron from the region of Debar, made using the original traditional design. 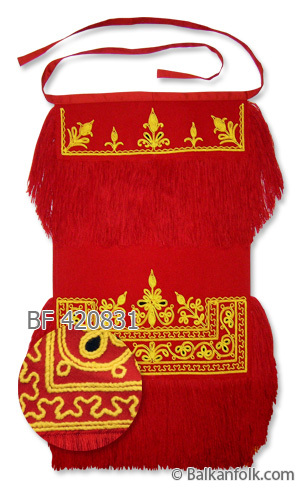 It is made from red woollen material and is decorated with a red fringe and yellow gaytan (coiling). With another red fringe on the bottom. Other sizes are available - if required please write to us. The apron is part of a woman's Macedonian costume - Debar.